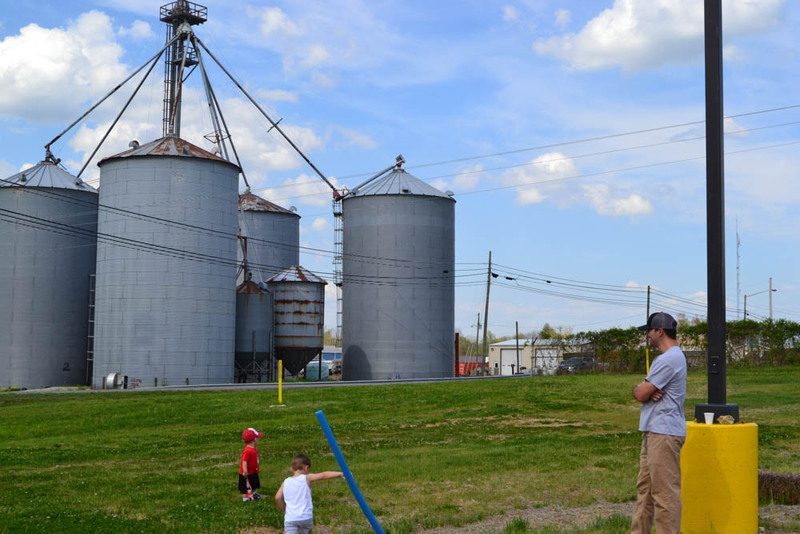 We started the day by driving out to Kelley Beekeeping Company…. AMAZING facilities, products, and staff. 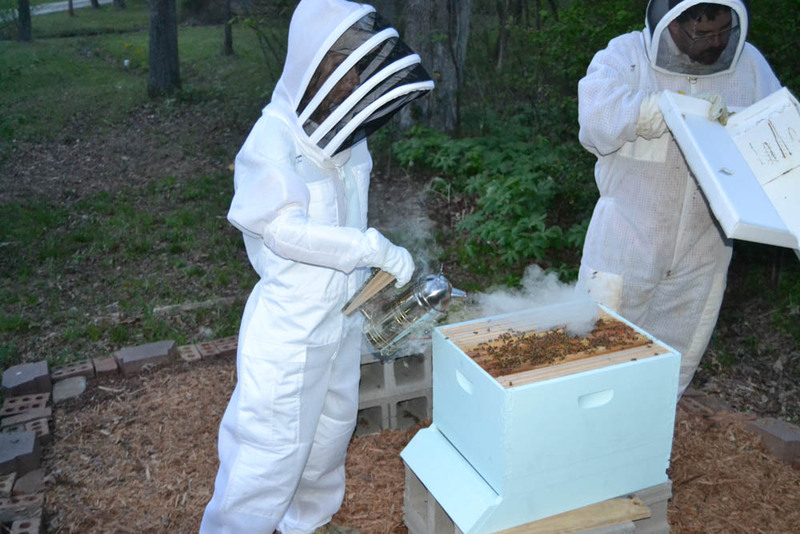 Immediately after picking up three new NUCS (basically a small, 5-frame hive with a bunch of bees, a queen, honey, and brood comb), our brakes went out. Not like just kind of squeaky… like, push-to-the-floor-and-no-stopping-kind of out. During our extended stay at Kelley’s we made some friends with the overly gracious and accommodating staff and decided to enjoy some photo ops with the boys. 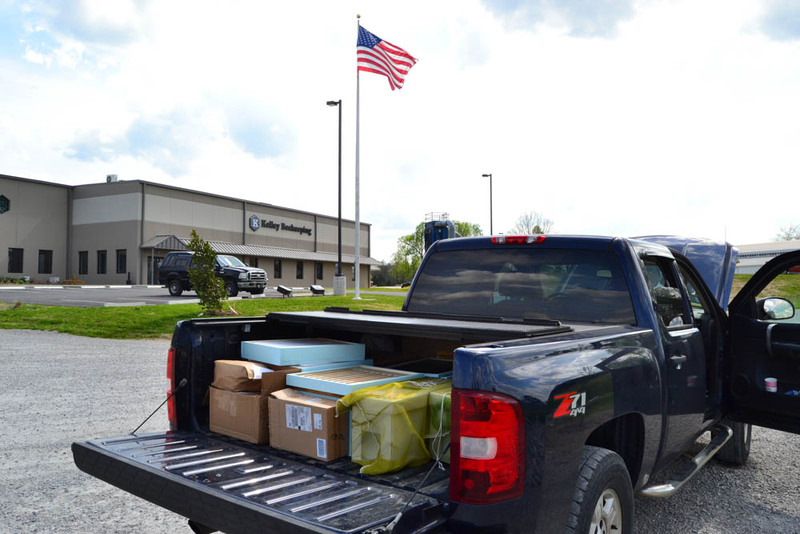 Truck FULL of beekeeping gear and 3 NUCS. 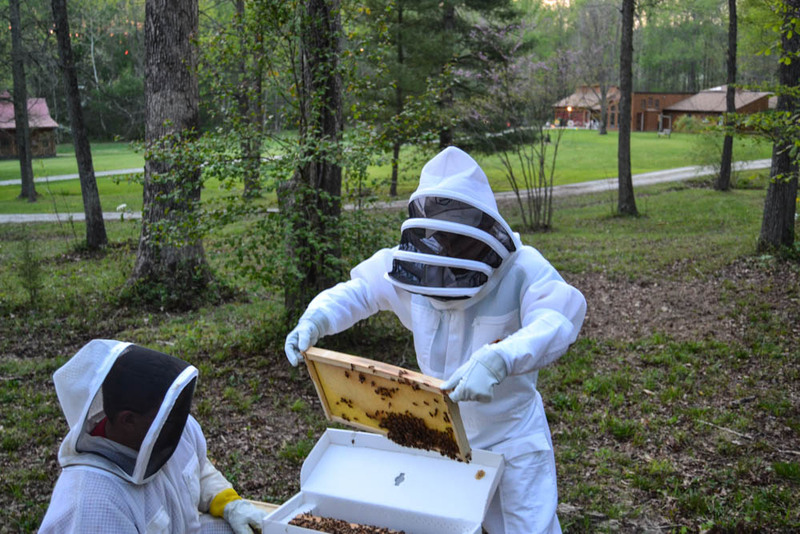 The boys getting some playtime in front of Kelley Beekeeping. 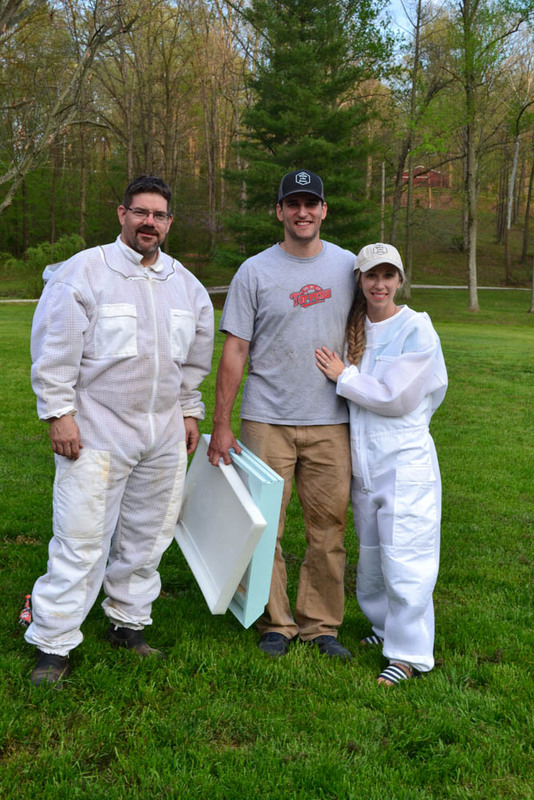 After family came to the rescue, we got a very late start on our bee installation. 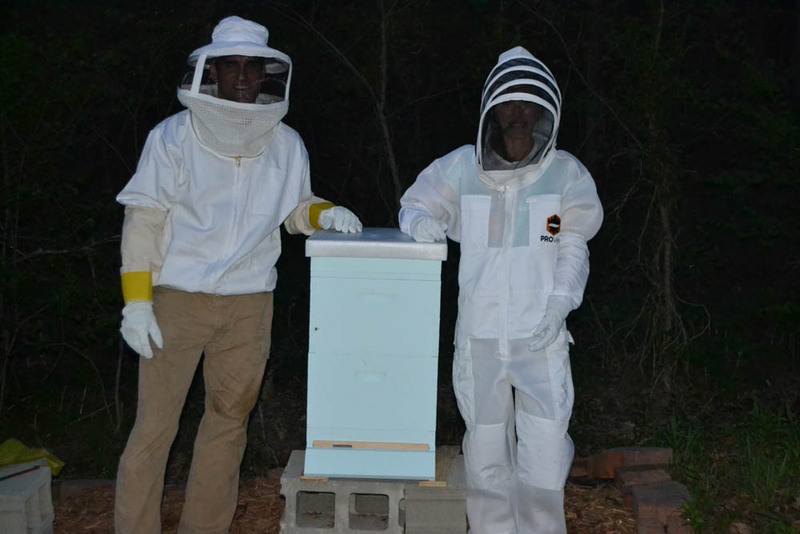 Uncle Matt helped us out as we installed one hive at Wade’s parents’ home and 2 on Matt’s land. 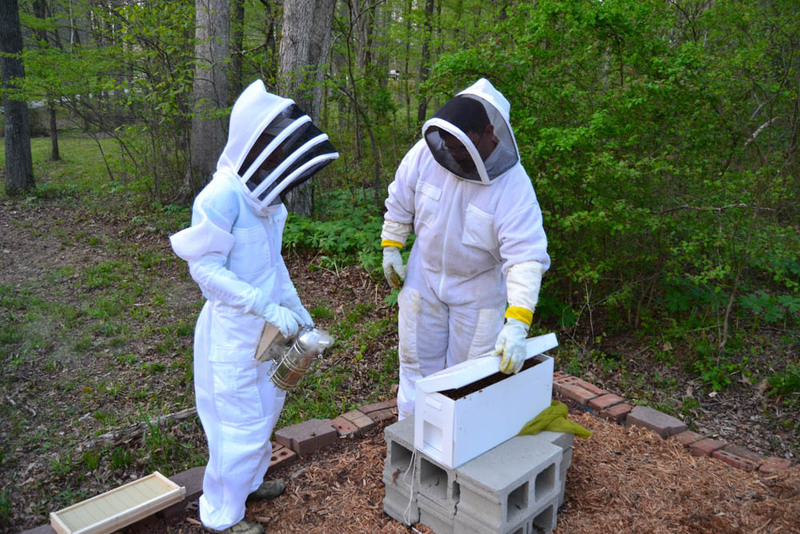 Making sure the hives are going to be level. They need to be level left to right, but slightly tilted forward so any water can flow out. 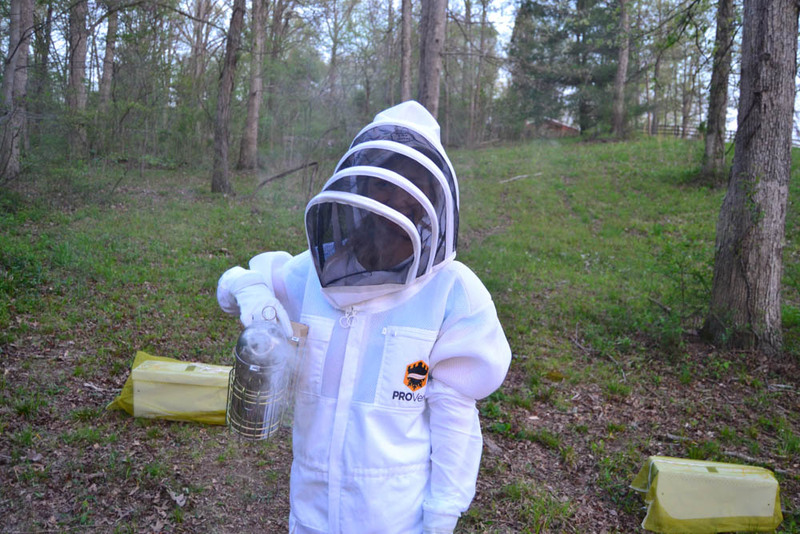 Ready to smoke some bees. Behind me are two NUCS in the yellow bags–just to prevent anyone from getting out and lost during the transportation. 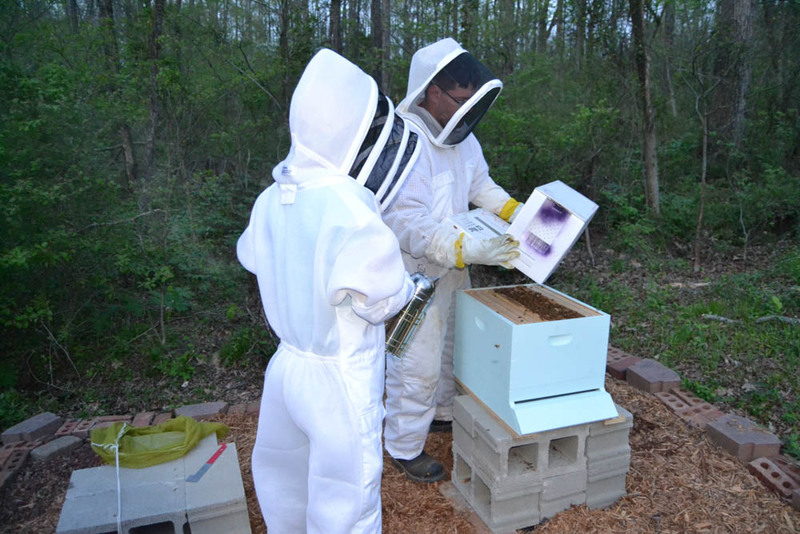 Moment of truth… opening the first NUC box. 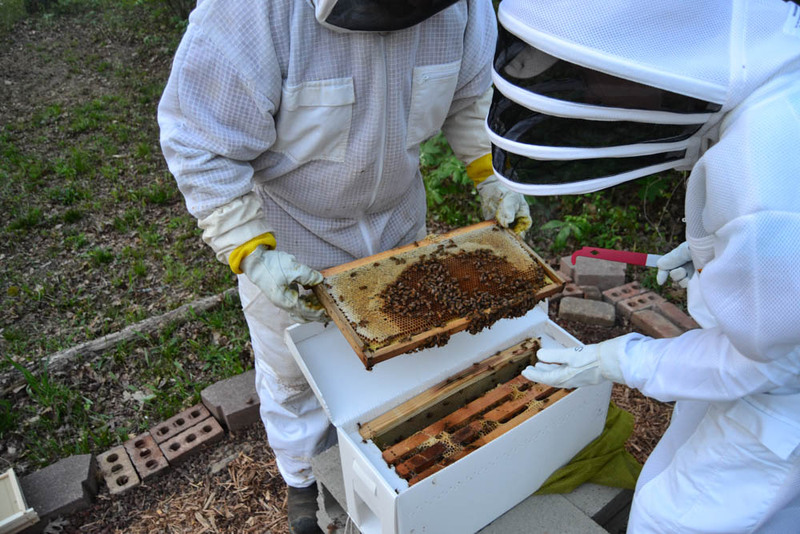 Every time we pulled out a frame, we had to inspect it searching for the queen. 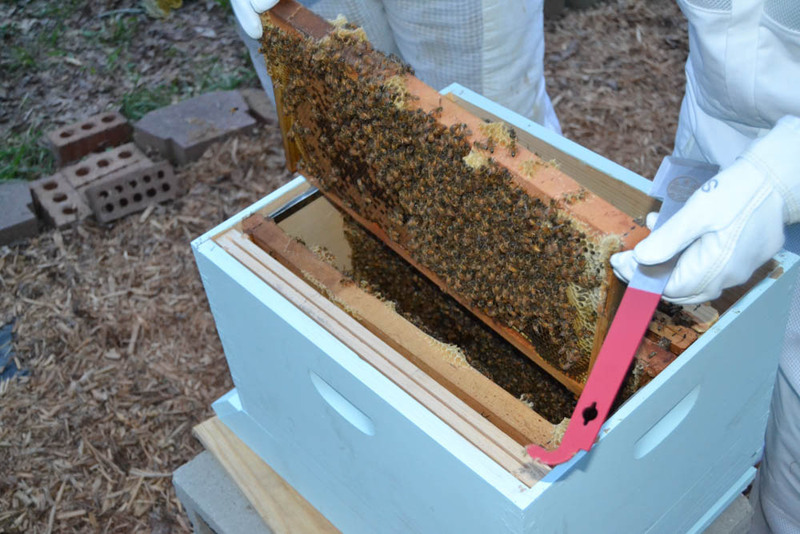 All 5 frames from the NUC are going to go into the center of our hive boxes. Placing 5 more frames around the NUC frames to fill in the gaps. See the NUC frame next to the new frame I’m adding? It’s warped pretty badly. This caused some problems for us toward the end of the installation. 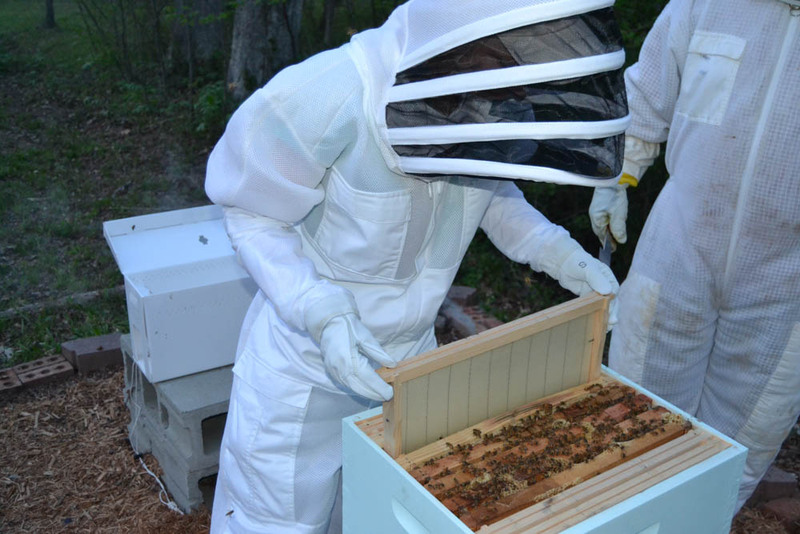 Matt adding the final few bees into the hive. Remember how I said that one frame was warped? Well, we just realized our top-feeder won’t fit on without a significant gap. What did we do? We added a second hive body on to make up for the gap. 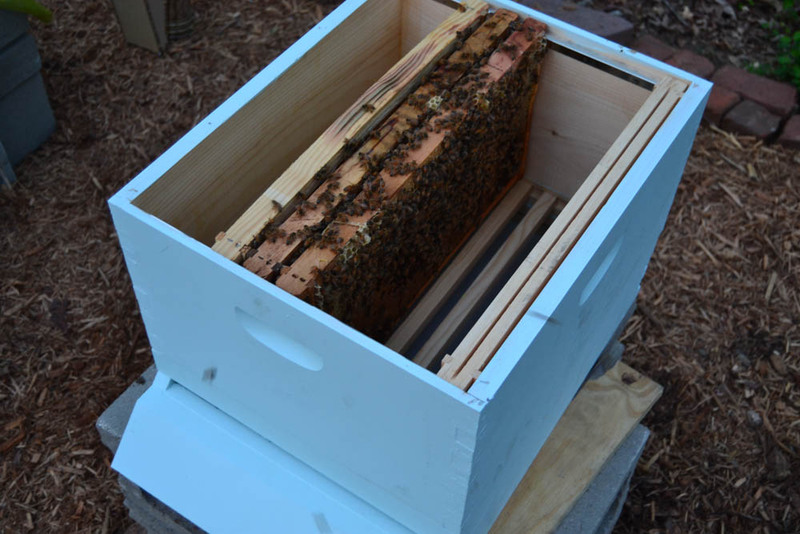 The top-feeder with a sugar-water mix didn’t allow for a tight closure with the warped NUC frame. A mason-jar feeder on the outside would’ve probably worked better, but we only had the top-feeders on us. 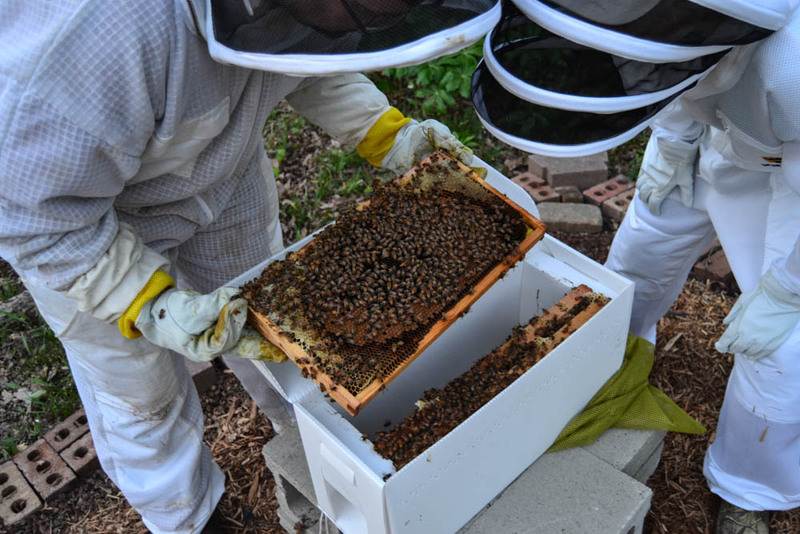 We figured it would be like the inside of a hollow tree (a natural home for bees), and we’re hoping the bees fill their frames before they start working on building lots off burr comb in the empty space before we get back out to check on the bees and readjust. 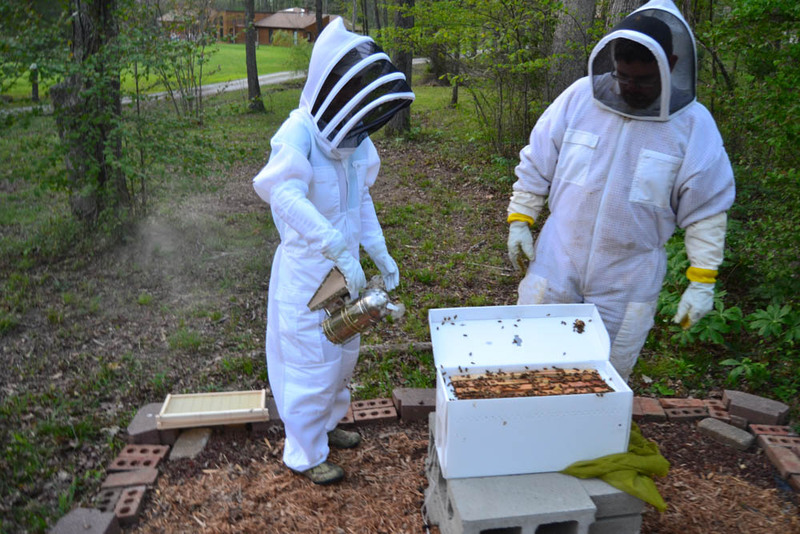 Beekeepers–ever have a similar experience? How’d you fix the issue? Leave us a comment or send us a message. 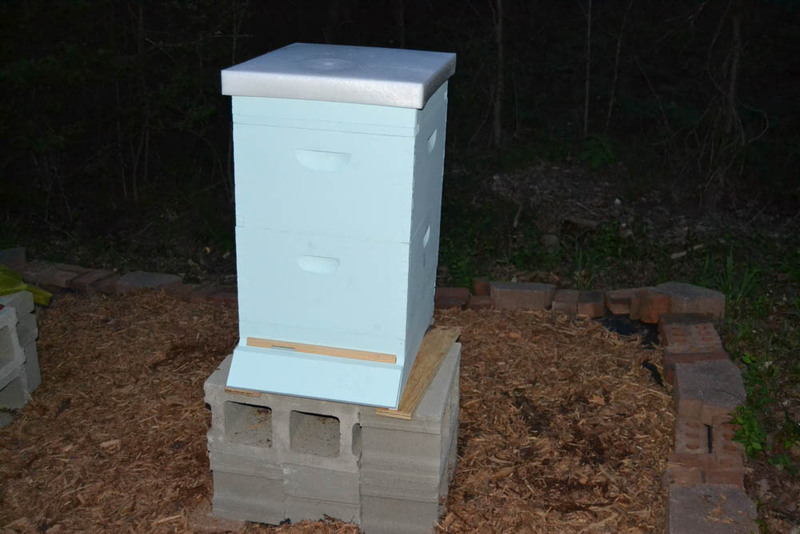 Words Like Honey Hive #1 installed! 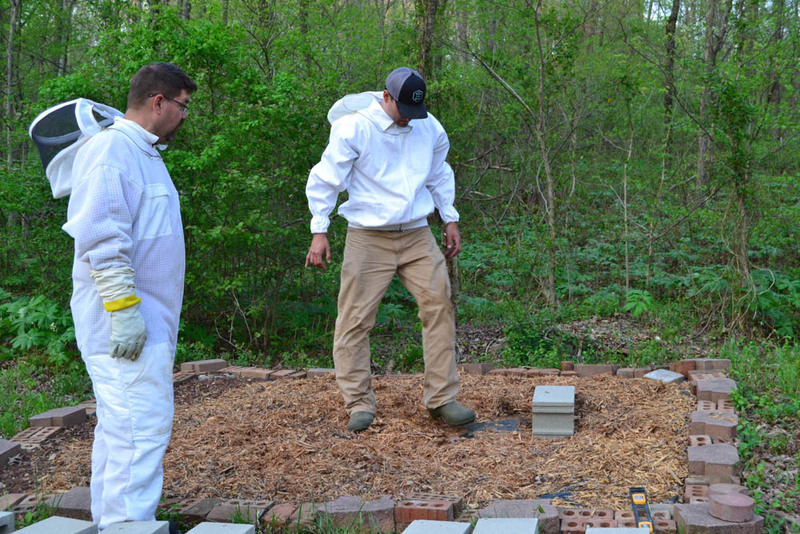 And yes–even though it was dark, we continued on and installed the other 2 hives on Uncle Matt’s property…. and then our truck battery died. Seriously. 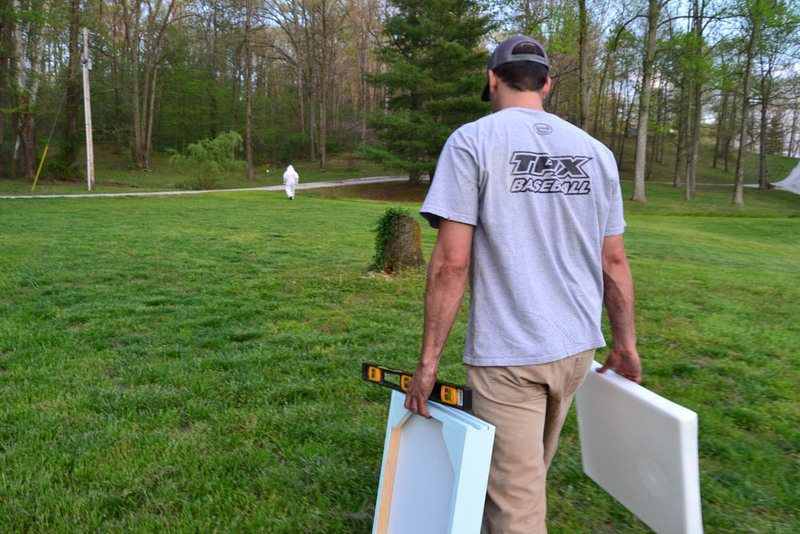 But I’ll take the extra quiet moments with my beekeeping-man, sitting on a tailgate on a warm Kentucky spring night, listening to coyotes, and staring at stars. Simple, beautiful pleasures.